Jo Malone has always been one of those shops that i would go into, get a bit carried away and spray everything - LOVE everything and come away empty handed and totally confused! The range is so amazing and i liked the sound of so many of their fragrances that i could just never make up my mind which i wanted. The two most popular lines are Pomegranate Noir and Lime, Basil and Mandarin but for that very reason they are two i avoided because i like to smell a bit different! They are both gorgeous scents in their own right but if a fragrance reminds me of someone else or smells familiar it is placed in the mental box of 'other peoples scents' along with a Guerlain fragrance that my old flatmate used to wear, Gucci Rush which is my best friends signature scent, pretty much all of the Chanel fragrances which are my mums staples (apart from Allure - Allure is mine!) and the very popular scents such as Estee Lauder Bronze Goddess which it seems everyone wears at this time of year. I then tend to avoid those fragrances because however much i like them, they don't feel like mine - i know this probably sounds a bit mad, i put it down to being an Aquarian! Anyway, after many fruitless trips i finally decided on two with the help of Jim who's opinion is pretty important when it comes to how i smell. I chose Blackberry and Bay and Peony and Blush Suede - neither of which would have jumped out at me because i don't tend to wear florals or fruity scents so it just goes to show that the old adage of not judging a book (perfume) by its cover (name) is true! Blackberry and Bay is a sharp fruity scent with a woody base (i'm really not an expert at describing fragrances so please bear with me) and i love it because its so unusual. This has become a real favourite of mine and i'm sure it will be repurchased when this bottle runs out. Its fresh and tangy and perfect for these lovely Summer days we've been having. Peony and Blush Suede is the real surprise for me because it was one that i totally dismissed but Jim really liked. When you first spray this onto the skin there is no getting away from it being a floral scent and this was enough to put me off, but give it ten minutes and it mellows into something really special. Its soft and warm and feminine without being too girly. I don't tend to reach for this as much as the Blackberry and Bay but its lovely for a special occasions. 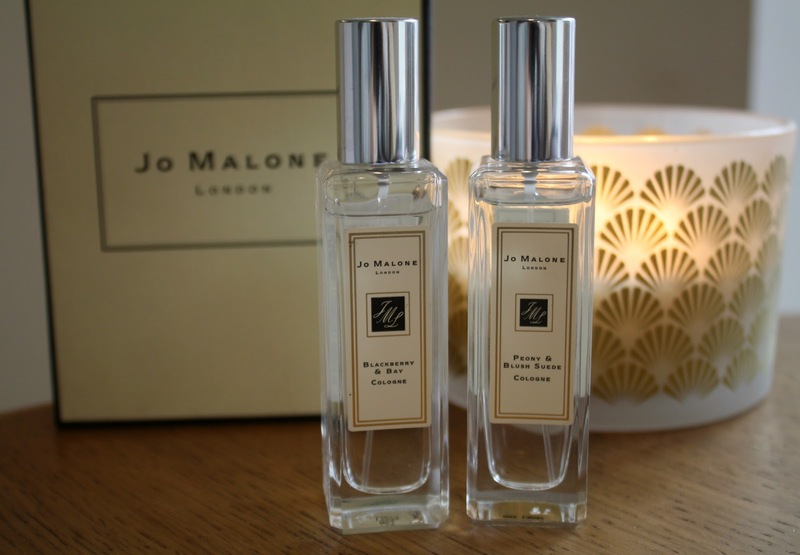 One of the things i really like about Jo Malone is that there is something for everyone; they have got all bases covered from Fruity and floral to spicy or woody, not to mention the line of Cologne Intense from which the Dark Amber & Ginger lily is hovering around the top spot of my current wishlist! Do you have any Jo Malone fragrances? Which one is your favourite or on your wishlist? I have English pear and freesia and wild bluebell, both of these two, white jasmine and mint and nectarine blossom are one my wishlist!! I rate them so much, they get the right balance between sweetness and sophistication. Only downside is the lasting power on me :( love that you bought it because your boy liked it, I used to work in a perfume shop and had so many boyfriends complaining that they didn't like their girlfriends scents! The White Jasmine and Mint was such a close third when i was choosing these! I totally agree about them getting the balance just right. I'm with you on the lasting power too, i have started spraying it onto my clothes so it lasts a bit better but i think i need a handbag backup to carry around with me. Haha i like to have a say in which fragrances my hubby wears so its only fair he gets an input in mine! Blackberry and Bay sounds amazing to me!